American Ballet Theatre concluded the third of its eight week 2018 Met Season with a week of performances of La Bayadère. When ABT premiered Natalia Makarova’s staging of the full ballet on May 21, 1980, it was generally considered to have been one of the most expensive in the company’s history. But it was money well spent. Every penny was used to create what was, and what largely remains, the company’s most sumptuous, refined, and enchanting production – from the ravishingly beautiful scenery created by Pierluigi Samaritani (I remember thinking, as I watched its premiere performance, that the way the sets looked to the eye seemed to be a reflection of the way his name sounded to the ear); to the equally sumptuous costumes designed by Theoni V. Aldredge; to the pitch-perfect lighting by Toshiro Ogawa, to John Lanchbery’s extraordinary arrangement of the compelling Ludwig Minkus score. It was magical. And with its opening night cast – led by Anthony Dowell as Solar, Cynthia Harvey as Gamzatti, Alexander Minz as the High Priest, and Makarova herself as Nikiya – the bar for future casts was set extraordinarily high. Except for one unfortunate example of apparent tinkering this season (which I’ll address later), everything that was brilliant about La Bayadère remains. Notwithstanding its silly story, its westernization of Indian culture (not at all unusual for the period in which Marius Petipa first choreographed the ballet in 1877), and its formulaic presentation, it’s far more than a spectacle. It’s accessible and fascinating and constantly engrossing, and it’s impossible to doze through even for those allergic to non-verbal theater. Even “standard” corps dances here take on an added patina of exotic sophistication and sensuality. This year’s seven performances featured three sets of debuts as Nikiya and Gamzatti. I was able to see two of each: Devon Teuscher’s Nikiya (at her second outing on Saturday afternoon), with Cassandra Trenary in her Gamzatti role debut, and Sarah Lane and Skylar Brandt in their respective role debuts as Nikiya and Gamzatti on Wednesday evening. While neither of the Nikiyas overwrote my memory of Makarova (or subsequent portrayals by Diana Vishneva, Altynai Aslymuratova, and Alina Cojocaru), both gave credible, though very different, role interpretations. In a different sense, similar was true of the two Gamzattis. Not unlike many classical story ballets (whether or not Romantic style), La Bayadère is strongly spiritual in the sense of there being an ethereal realm of spirits and fantasies; an alternative, rarified reality to imagine, dream about, or fear. But, like Giselle or Swan Lake and perhaps others, La Bayadère adds another ingredient, one decidedly non-secular (and non-mythological): the implicit presence of an omniscient and omnipotent deity that one defies at one’s peril. Vows are sacred. If you make a promise to God, usually in the form of swearing your undying love “before God” for another, you’d better keep your vow or suffer some form of God’s wrath. Accordingly, the broken heart that creates the madness in Giselle and the suicidal decisions by Odette and Nikiya, may be seen as not just having been created by the male character’s weakness, but by his having, for whatever reason, broken this sacred vow. And the emotional component in La Bayadère is perhaps even stronger because of Nikiya’s being, in a sense, the deity’s honored servant. That, more than its being an exotic travelogue or a story of true love overwhelmed by circumstances, is the force that moves La Bayadère’s story to its inexorable end. It also places the plot developments in a context – and might explain differences in interpretation depending on how dominant this component of the story is. When Teuscher’s Nikiya first appears, she’s neither suffering nor impassioned. And it’s perfectly appropriate for a temple dancer who may have been low-born, but has acquired a presence of spiritual nobility by virtue of her association and her position. She shouldn’t be miserable – she’s not a slave, but in service to a higher calling. Teuscher maintained this presence throughout her performance. It wasn’t one-dimensional, but it was limited to being a character that was crystalline and serene, to which a measured level of happiness or anger was applied depending on the situation (being with Solor; confronting Gamzatti). There’s nothing wrong with this portrayal – in fact, it’s my preference for the role: Nikiya as a spiritual being. Her execution was pristine as well, and her “scarf” variation with Solor in the Act II vision scene was perfectly executed. In short, Teuscher’s performance was impeccable. That having been said, there was a distance to Teuscher’s Nikiya that made her more of a character being portrayed (as finely communicated as it was) than a “real” person one might empathize with. There were no chances taken in emotional or choreographic execution. What was presented was what was supposed to be – nothing less, but nothing more. I might not have sensed the absence of anything in her portrayal had I not seen Lane’s Nikiya on Wednesday afternoon. What was absent was passion. Instead of displaying an air of spiritual serenity, Lane’s Nikiya first appeared in Act I as suffering miserably. To me, that’s not an appropriate characterization of a character on a higher spiritual plane. The appearance doesn’t fit – unless one considers Nikiya to have been enslaved, or perhaps already a victim of the High Brahmin’s unwanted attention, neither of which is consistent with the story. I recognize, however, that although this demeanor is not my recollection of the way Makarova herself initially appeared, nor Asylmuratova, nor Cojocaru, nor, even earlier, in performances by Marianna Tcherkassky that remain vivid in my mind, in recent incarnations that’s frequently been the way Nikiya is first introduced. When I initially saw Vishneva’s Nikiya, I commented then, in a 2010 review, that she came across too severe and gloomy; too dour. [An extreme form of this was the guest appearance by the Bolshoi’s Olga Smirnova in 2014 (while then still a soloist), in which that dour demeanor was maintained way too long, and which manifested later as a contorted body in which whatever emotions there were were kept under strict control.] So it’s not “wrong” – it’s just not my preference. But Lane’s initial dour visage disappeared quickly – replaced not by serenity, but by passion, and at a level I don’t recall seeing previously. It opened my eyes to a vital aspect of Nikiya’s characterization in Act I that I’d not previously considered. Both Nikiyas delivered the essential mime clearly, but Lane did so with an emotional edge. In response to the High Brahmin’s declaration of love, it wasn’t “you’re the High Brahmin; I’m only a lowly temple dancer/water bearer,” it was “How dare you; you’re God’s representative on earth.” And she wasn’t just happy / relieved to see Solor, she was ecstatic. When she swore eternal love over the sacred fire, it was way more than going through the motions – she was lit from within. And instead of a portrayal that was relatively flat, there were gestures, nuances, that she visibly added: she didn’t attack Gamzatti with a knife, for example, she attacked her first, and throughout, with her eyes. All this passion was, appropriately, kept beneath the surface in Acts 2 and 3, but to my eyes it clearly remained. I never had the impression that Lane was only portraying a character; she was living it, and the character meant something more than being merely a character. Technically, there were some minor hiccups that made that aspect of Lane’s performance less than perfect (e.g., her Act 2 scarf /shawl dance was somewhat tentative), but nothing that would be noticeable to someone other than a purist. On the other hand, and consistent with wearing passion on her sleeve, she took chances, creating images of extraordinary beauty (her two-footed en pointe transitions to arabesque in Act 1, Scene 3 were not just flawless, but luminous). And in the tumultuous Act 3 pas de trois, she and her Solor delivered a memorable sequence of time-stopping lifts that elevated this already incomparable crescendo of a scene to high art. “At the top of a lift, she’d stop the action ever so slightly as if frozen in time. One might think that this would adversely affect the choreographic flow, but it didn’t – on the contrary, it made ‘routine’ lifts look breathtaking.” That’s the way I described Cojocaru’s 2014 performance; I hadn’t seen anything comparable to that until Lane’s debut on Wednesday. Cojocaru’s Solor at that performance was Herman Cornejo, and he partnered Lane on Wednesday as well. Obviously, it took both Cornejo and Cojocaru’s talents, and Cornejo and Lane’s, to make those images happen as brilliantly as they did. Both Cornejo on Wednesday and Teuscher’s Solor, Joo Won Ahn, were superb Solors. That Cornejo would execute the role and partner as well as he did was not unexpected, but the performance by Ahn, still a member of the corps, was a pleasant surprise (he debuted in the role with Teuscher earlier in the week). If there were any technical glitches in his performance, I didn’t notice, and his acting, while maybe a notch beneath those with more extensive experience, was commendable throughout. The role of Gamzatti is a complicated one. In addition to being able to execute the choreography (which is at least as challenging as the choreography assigned to Nikiya), she must walk a characterization tight rope – she must be seen as a villain – in direct contrast with Nikiya’s purity of soul. But she can’t be too malevolent, because she’s also a victim here – she’s daddy’s little girl, who must marry the man daddy’s chosen for her. And notwithstanding the arrangement, she also falls for Solor independently (significantly, however, first with his portrait). So not only must she do her father’s bidding, she must defeat an unanticipated rival without alienating Solor in the process. And she must come across as radiant and beautiful – a true rival for Nikiya, not one who might engender undue sympathy for Solor’s plight. Although technically comparable, the performances by Brandt on Wednesday evening and Trenary on Saturday afternoon produced radically different results. Brandt captured Gamzatti’s character in an instant. Her Gamzatti appeared initially as grand, haughty, and superior, and she maintained that aura throughout. She kept her intentions secret to all but her servant Aya, but there was always an evident acknowledgement conveyed to the audience that she was doing what she was supposed to do, and although she was desperate to win, she was also entitled to win, and would do whatever it takes – there was no other option. And in Act 3’s extraordinary pas de trois, which she, Lane, and Cornejo delivered as sumptuously as I can recall, she was a woman wronged, and who had that entitlement rug pulled out from under her. To my eye, Brandt nailed it. Trenary, who I picked out as a dancer to watch with her first ABT performance in 2011 (in an otherwise forgettable piece, Private Light, by the Stuttgart Ballet’s Demis Volpe), came across in Saturday’s performance as beautiful, but essentially vacuous. There was no haughtiness, no malevolence, no entitlement, no expression beyond being beautiful (and red swaths of make-up that apparently was intended to make her appear more sinister only made her look florid) . [But maybe there was a method behind this – in contrast, Teuscher’s Nikiya looked far more multi-dimensional.] And perhaps the most telling expression of this was at the end of Act I: as the fatally poisonous snake (asp) that Gamzatti had had planted (or had ordered Aya to plant) in a flower bouquet bit Nikiya, and as Nikiya was was dying, this Gamzatti looked absolutely clueless – as if she had no idea what had happened. This is different from feigned ignorance, transparently conveyed to the audience but kept hidden from Solor. There was no layering of emotions, no sense of hidden culpability, no sense of satisfaction at having eliminated her rival, all of which appear in the best of Gamzatti portrayals, just bewilderment. Trenary has demonstrated in previous roles that she’s a far better actress than this performance indicated, so I don’t doubt that her portrayal will gain interpretive traction with additional opportunities. Roman Zhurbin and Thomas Forster were respectable High Brahmins on Wednesday and Saturday, with Forster coming across as more powerful, but both were equally and appropriately thuggish. Alexei Agoudine excelled as the Rajah on Wednesday, as did Alexandre Hammoudi on Saturday although with slightly less aggressiveness, and Courtney Shealy’s Aya (she debuted in the role earlier in the week)improved markedly between Wednesday and Saturday, although, to my eye, she’ll need to ramp up Aya’s serpentine quality as she gains experience. 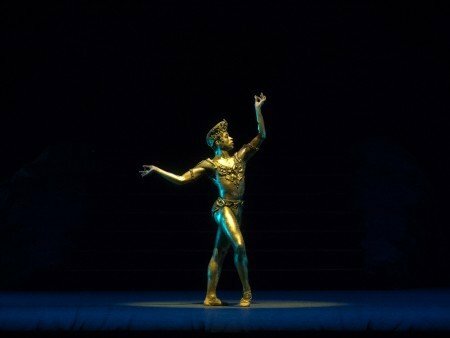 And as the Bronze Idol, Joseph Gorak danced with elegance and finesse on Wednesday; a statue’s perfection come to life. But Gabe Stone Shayer’s portrayal on Saturday was more rough-hewn, and more compelling to watch. And then there’s the corps. As those who have already seen or heard of this ballet know, the corps is as much a featured role in La Bayadère, collectively, as the leads are individually. 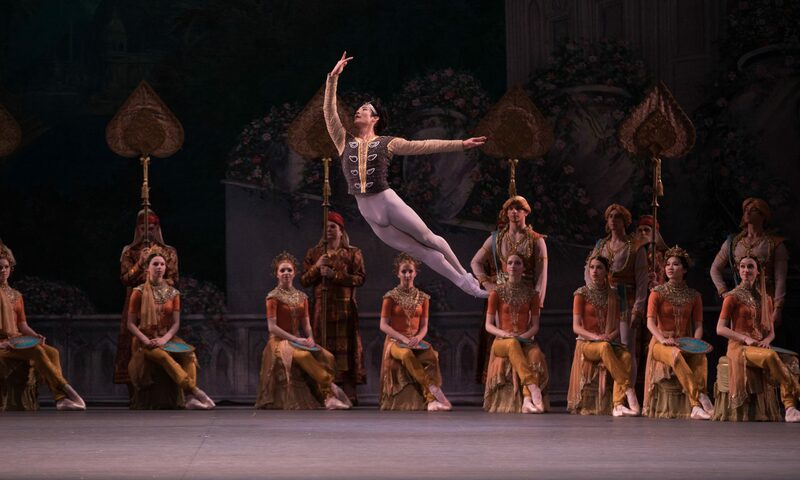 At Wednesday’s performance, as fine as they were in the magical Act II entrance, they didn’t seem quite as uniform (without being machines) as I remember – one or two had uncharacteristic difficulty raising a leg in arabesque or maintaining balance. But Saturday afternoon they performed this iconic scene flawlessly (the three featured shades at each performance, Zhong-Jong Fang, April Giageruso, and Catherine Hurlin, executed superbly on both occasions). My only complaint about these performances relates to an image that appears to have been added to the production. In the two performances I saw, at the end of Act I, as Nikiya rejects the antidote that the High Brahmin gives her, Solor, after departing with Gamzatti (which is what prompts Nikiya to reject the antidote), returns to catch Nikiya as she falls dead to the stage floor. I’ve seen Makarova’s La Bayadère on too many occasions to count, and don’t remember that happening at all previously (and persons with whom I’ve spoken afterward don’t recall it either). I’m aware (via photos) that this is a component of other productions, but to me it’s superfluous, and makes no sense. Does the audience need ratification that Solor really loves Nikiya? And would he just run from Gamzatti, after having only moments before exited knowing then that Nikiya had been poisoned? [One might argue that he might have seen the High Brahmin hand her the antidote, and assumed she’d take it. But the audience doesn’t know that that’s what he saw, and even if he did, his exiting with Gamzatti at that point, aware at least of Nikiya’s suffering, would convert him into a callous creep rather than one compelled by circumstances.] And do we really need yet another image to support La Bayadère’s connection to Giselle? I hope this decision is revocable. It adds nothing. If past is precedent, ABT will return La Bayadère to its repertory again next year, when those who debuted this year should have additional performing opportunities to grow in their roles. And if one hasn’t already seen it, one must do so then. La Bayadère is guaranteed to make even the most tepid ballet audience excited – it’s by far ABT’s most magnificent ballet, in every respect. It was Makarova’s gift to the West in 1980, and it remains a component of her lasting legacy.